Working as a mentor and trying to make a positive impact on a student’s life has been such an incredible experience. Some students have gone through tough situations where they really need help – and some just need a little extra push. Whatever their circumstances, they all benefit from a person checking in on them, and knowing that somebody has their back. I just try to be whatever they need me to be and make a difference any way I can. Macrus Boyd with St. Petersburg High principal Darlene Lebo. It feels surreal to be named Mentor of the Year, because I’m not doing this for recognition – even though I do very much appreciate the honor. I found out around the same time I was accepted to the Coast Guard’s officer candidate school. When I came to St. Petersburg High for my mentor session, the woman at the front desk said, “I hear you have some congratulations in order.” I thought she meant officer candidate school, so I was completely caught off guard when I walked in the room, and there were balloons and cake and everyone cheering. It was a really humbling experience. It’s taught me a lot, too. First, you learn to be a better listener, instead of just waiting for your turn to talk. And listening shows me that there’s always so much more to be done – and motivates me to want to help more. Mentoring also gives you a helpful perspective on life: that everything isn’t about you. We all have hectic schedules and busy lives, but these kids have even more on their plate than that and they need guidance. And I’m so glad I’m in a position to be of help to them. As for my own background, you might say I’m a military brat. My family is originally from Missouri, but I grew up in Texas and Arkansas and went to high school in Minnesota. My father was in the Army and retired after 20 years – first 10 serving in the infantry and the last stretch as a recruiter. He was gone a lot when I was little, but we lived on a base and had a lot of support and fortunately he was back home during my middle and high school years. It wasn’t easy moving around a lot as a kid, but I was always in social clubs and basketball was a big thing for me all the way through high school – that was how I would break the ice and make friends. Honestly, I had no desire to go into the service at the time, and my dad eventually stopped suggesting it. Instead, I was accepted at Southern Illinois University-Edwardsville and attended freshman orientation, and that’s as far as I made it. As soon as I learned how much tuition and room and board would be. I didn’t want my parents to have to go into debt, so I left and started looking at other options. I had never thought about the U.S. Coast Guard, but my dad had a co-worker who said it was the best-kept secret. I checked it out, spoke to a recruiter and I was sold! At the very least, signing on would allow me to get my college education. And it turned out to be the best decision I made – here I am 13 years later, with a degree in criminal justice from Loyola University in New Orleans and a great career, currently working as a recruiter just like my dad did. I love talking and interacting with people, and being in the Coast Guard allows me to do that. It’s been a great ride. While stationed in New Orleans, and attending Loyola, I also found time to volunteer as a coach/mentor to lower-income kids for a non-profit in New Orleans and I learned how good it felt to help to give of your time. 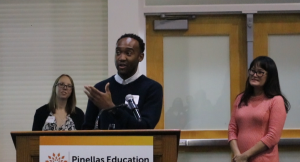 Boyd accepting his honor at the Pinellas Education Foundation’s Donor, Mentor, Volunteer appreciation reception Jan. 17, with Suzanne Pace of SPHS (left) and Dr. Stacy Baier, President of the Foundation. 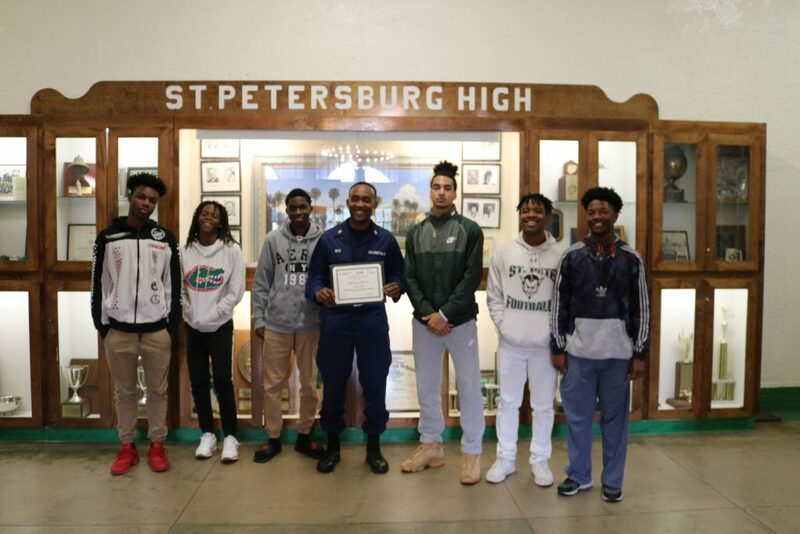 I learned about the mentoring opportunities at St. Petersburg High School from my Coast Guard recruiting duties, which brings me to area high schools. One day, I ran into Suzanne Pace, the school’s community liaison was helping me set up to speak, and asked me and my supervisor if we would be willing to mentor. We immediately said yes, and initially did it together – I had one student and he had two. My student was very quiet and it took a little while to get him to open up. Plus, he’s so smart, I wondered at first how I could help him and why he needed a mentor. But he was going through normal high school type stuff – and the lightbulb went off. That’s what I’m here for. Then, when my supervisor transferred to New Jersey, I took on both of his students. And this year, Ms. Pace asked if I could work with three more students. Sometimes students don’t stick around if they don’t relate to their mentor, and she felt I could help them. I enjoyed mentoring so much, I couldn’t say no. It works because we break them up into two groups of three, and I meet with them every Thursday in alternate weeks. Life can be busy with my job, my wife Ellen and I raising two little kids under age 3, and mentoring. But I just make the mentoring work because I know it’s necessary. Especially when you learn more about Take Stock in Children, you learn how much these students need a mentor. I really look forward to it, too. In fact, after working with these kids, I can’t imagine not making mentoring part of my life. 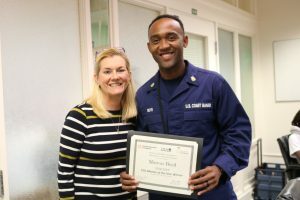 Editor’s Note: Marcus Boyd, a St. Petersburg-based recruiter for the U.S. Coast Guard, was named Mentor of the Year earlier this month by the Pinellas Education Foundation, for his dedication in mentoring first one, then three and now six students at St. Petersburg High School who are part of the Pinellas Education Foundation’s Take Stock in Children program. 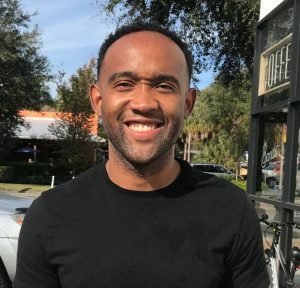 Since January is National Mentor Month, we asked Marcus to write a blog about what moved him to become a mentor, what his own journey has been and what his thoughts are about mentoring. If you are interesting in signing up to become a Take Stock in Children mentor, please contact Kimberly Landry at kimberly.landry@pinellaseducation.org or 727-588-4816, ext. 2123. Boyd with the six St. Petersburg High students he has mentored.